Most medium- to large-scale manufacturing projects require a combination of various incentives to fill a variety of financial gaps. Today’s traditional capital sources are not sufficient for project costs without a tremendous amount of developer equity. Obtaining certain subsidies, credits, or grants in connection with these economic development projects can often be the financial difference maker for an otherwise viable project. Upon learning that New Markets Tax Credit (NMTC) financing can create as much as a twenty-five percent (25%) subsidy for their project costs, many of our manufacturing clients initially ask, “Where is the catch?” While NMTC transactions involve a competitive marketplace for allocation and pose a somewhat daunting task, borrowers who reach financial closing are greatly rewarded. The NMTC program was enacted as part of the Community Renewal and Tax Relief Act of 2000 (P.L. 106-554, 113 Stat. 2763) and is designed to encourage new private sector investments in low-income communities (LICs). NMTCs are allocated by the Community Development Financial Institutions (CDFI) Fund, a bureau within the United States Department of the Treasury that runs the NMTC program, under a competitive application process. Corporate taxpayers may participate in the NMTC program by receiving a credit against federal income taxes for making qualified equity investments (QEIs) in designated Community Development Entities (CDEs). The credit received is equivalent to thirty-nine percent (39%) of the QEI, and is is utilized over a seven year period (five percent (5%) for the first three (3) years and six percent (6%) for the four (4) remaining years). QEIs may be leveraged with various types of secured debt (e.g., conventional lending or bond financing) or affiliate debt, which allows the tax credit investor (the Investor) to receive tax credits on the equity/debt combination. The resulting subsidy to a project generated from the monetized NMTCs can amount to as much as twenty to twenty-five percent (20% – 25%) of the total cost of the project. The NMTC program has proven to be an effective means of rebuilding economically distressed communities, and new and rehabilitated projects are being developed throughout the country as a result, including manufacturing facilities, schools, retail centers, office buildings, and hotels. In most cases, the NMTC program utilizes geographic qualification based on the census tract location of the project. In other words, the first step to learning whether your project qualifies for NMTCs is to determine the location of the project and whether or not it is located in a “qualified census tract.” Qualifying census tracts have either (i) a poverty rate of at least 20%, or (ii) a median family income below 80% of the greater of (a) the statewide median family income, or (b) the metropolitan area median income. While a census tract will qualify if it meets one of the above criteria, most CDEs that receive credits commit to serve areas of higher distress, which include (a) census tracts with a median family income less than 60%;(b) census tracts with poverty rates greater than 30%; (c) census tracts with unemployment rates at least 1.5 times the national average; (d) census tracts located in counties not contained within a Metropolitan Statistical Area (MSA); and (e) projects serving Targeted Populations. In fact, over 70% of NMTC investments have been made in highly distressed areas. NMTC financing can be used for real estate acquisition, site prep, substantial rehab, new construction, tenant build-out, equipment, and soft costs. Typically, projects need to have costs of at least $5 million in order to attract adequate interest from CDEs and Investors. In a typical transaction, an Investor provides an equity investment into a special-purpose entity (Investment Fund) in exchange for 100% of the membership interests. A third party or affiliate lender provides a loan (the Leverage Loan) to the Investment Fund. This debt/equity combination generates sufficient funds for the Investment Fund to make its QEI as a capital contribution to a CDE. The applicable credit allowance for the benefit of the Investor is calculated based upon the QEI. CDE(s) use the proceeds of the QEI to make loans to a qualified active low-income community business (QALICB). The loans are generally structured to mature or be refinanced in seven years, and can be subordinate to senior debt as necessary. The “A” loan usually mirrors the terms of the Leverage Loan. The “B” loan (which is derived from the tax credit equity less CDE fees) is generally at a below-market interest rate, with favorable terms such as full or partial loan forgiveness. Both loans are interest-only during the seven-year compliance period. The QALICB uses the proceeds of the loan to finance all or a portion of the project. 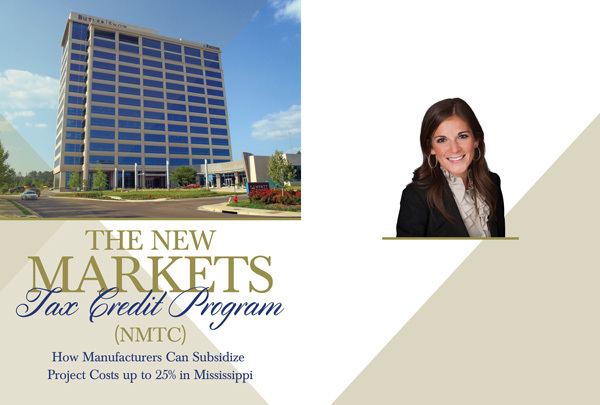 In addition, many projects financed in Mississippi utilize the Mississippi Equity Investment (New Markets) Tax Credit Program, which was created as a “piggyback” credit to the NMTC program. This state credit is a credit against income or insurance premium taxes in an amount equivalent to twenty-four percent (24%) of the QEI, and it is utilized over a three-year period (eight percent (8%) per year). The maximum amount of state credits that can be generated from a single project is $2.4 million, or $800,000 per year. Purchase prices vary depending on the current market, but generally speaking, borrowers can expect (assuming a maximum project cost of $10 million) to generate an additional $1.2 million of subsidy. In summary, the NMTC is a non-refundable tax credit designed to encourage private investments in eligible LICs. As a general rule of thumb, the resulting subsidy to a project generated from the use of NMTCs can amount to as much as twenty to twenty-five percent (20% – 25%) of the total cost of the project. In other words, every dollar generated in equity from the NMTC is a dollar saved for the project borrower. Since NMTCs provide a substantial current and long-term subsidy to the construction and operation of a project, every medium- to large-scale manufacturing project should consider the NMTC program as an alternative source of financing. Anna H. Watson is an attorney in Butler Snow’s Public Finance, Tax Incentives and Credit Markets Group. She focuses her practice on Municipal Bonds, New Markets Tax Credits, Public Finance and Economic Development Incentives. Contact her at www.butlersnow.com or anna.watson@butlersnow.com.